Use the New Promotion Request page to submit promotions. 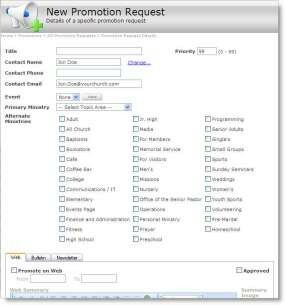 Your Arena Administrator likely has permissions set so that several staff can complete a promotion request and select staff to approve promotion requests. 1. From the Promotions menu, click the New Promotion Request option. •Title – Enter a title for the promotion. •Priority – Enter the priority for the event. The priority is an option to determine which promotions to display on the Arena-managed web site and in what order, on a scale of 0 to 99 (0-99 is lowest to highest). •Contact Name, Phone and Email – Enter the contact name for the event if the record does not exist in Arena database or click the Change link to select from existing records. •Event – Verify the event displays in this drop-down. Click the View button to view the details of the Event. •Primary Ministry – Select a Primary Ministry for this event. This determines where to display the promotion on your Arena-managed website. •Alternate Ministry – If applicable, select alternate ministries. 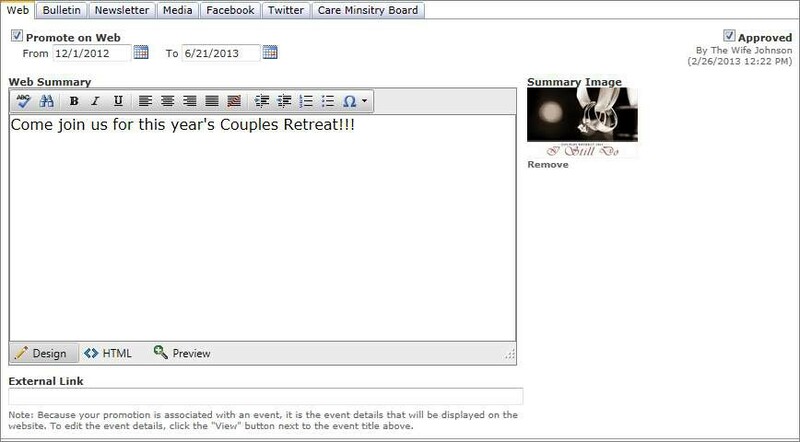 The Primary Ministry indicates the primary instance of the promotions module/control on your organization’s Arena-managed webpage that this promotion displays on, while Alternate Ministries indicate any other instances of the promotions module/control that display this promotion if there is an empty spot available. 3. Select the Web tab. 4. Complete all fields, as desired. •Promote on Web – Select this check box to display on the web. •From and To Dates – Enter the dates the promotion should be available on your Arena-managed website. •Web Summary – Enter a summary for the event. Use the HTML option to add any HTML formatting. •Summary Image – Upload an image for the promotion. •Approved – If available, approve the promotion. You can also approve promotions on the All Promotions page. •External Link - If this event is a dedicated page, enter the respective URL. 5. Select the Bulletin tab. 6. Click the Add Bulletin Request button. Complete all fields, as desired. •Date – Select a date. Available dates are for Sunday and Wednesday. To customize see your Arena Administrator. •Approved – Check this box to approve. •Priority – Set the priority. •Published – Check this box to track bulletins you publish. •Child Care, Online Registration, Event Table – Check the desired options for each bulletin promotion. This is a customizable Organization Setting. See your Arena Administrator for more information. 7. Click the Delete icon to delete a bulletin promotion. 9. Select the Newsletter tab. 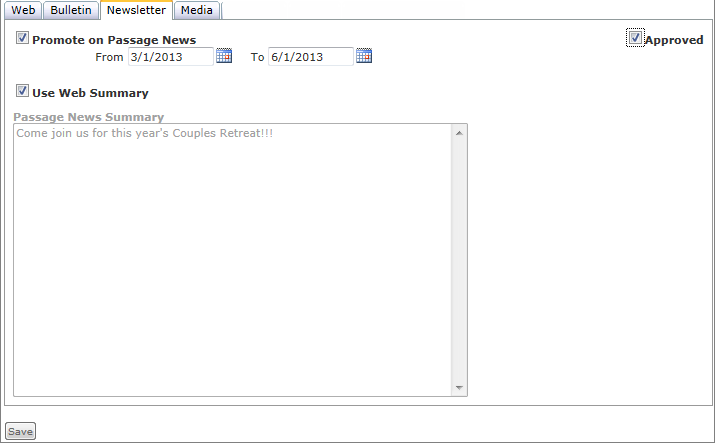 You have the option to use the summary from the web tab or enter a new summary for newsletter. 10. Complete all fields, as desired. •Promote on <newsletter name> - Check this box to enable. •From and To Dates – Enter the date to begin and end the newsletter promotion. •Use Web Summary- Check this box if you want to use the same summary from the Web tab. If you select this option, the web summary displays disabled in the summary section. •<Newsletter name> Summary- If not using the Use Web Summary option, enter the newsletter summary. •Approved – If available, select the Approved check box. This option is to enable an approval process. 11. Click the Media tab. This is a customizable tab.